Did you have any idea that your game would improve if you wore different shoes to play on artificial turf? Me either. Let me tell you about when I tried to play field hockey on artificial grass while I was wearing indoor sports shoes. On second thought, I won’t: just cue the song “Slip Slidin’ Away”, and you’ll know what I mean. If you want to play your best, it’s important to suit up right, and footwear is an integral part of playing sports. The thing is, synthetic sports fields are denser than the live grass-covered ones. If you’re wearing the wrong footwear, you may not be able to pivot properly. Since the surface is harder, when you make sharp movements—like that 90-degree turn on the football field to fake out the other team—the artificial grass may grip your shoe, unless you happen to be wearing short cleats. Who would have guessed there could be a special turf shoe? Watersavers knows the score about all things turf-related, so check out our website and get all the information you need. There are more than a few sports footwear choices on the market. Some are made from rubber, plastic, leather, and manmade materials, but the intent is all the same: to perform well under field conditions. There are indoor shoes, outdoor shoes, and then there are turf shoes. This type of athletic footgear has smaller cleats than other models, specially designed for playing on artificial grass. Turf shoes allow a player to be faster and agiler when playing sports on synthetic turf. These models feature dozens of small, close-together rubber cleats on the bottom (as opposed to eight to 15 on regular cleats) and are designed to offer the player max mobility, so the bottoms are not very stiff. Regular cleats come in high- and low-top versions, but remember that mobility is the key, so these cleats are usually available only in low-top form. Now you won’t get as much support as the high tops, but again, this type of footwear is made to reduce slippage, so that extra mobility is important. These ½-inch rubber cleats, aka firm-ground footwear, are also shorter than regular 1-inch cleats, which means they won’t tear up the “grass” because they don’t dig in as much. A recent study shows that playing games on surfaces and injuries relate to footwear. Dr. Mark Drakos, a fellow at New York City’s Hospital for Special Surgery, conducted a 2008 study in which he found that the turf shoe caused the fewest ACL injuries. His study made it into the Journal of Biomechanical Engineering in 2010. Wearing the right sports shoe when playing pro games on artificial turf is important. 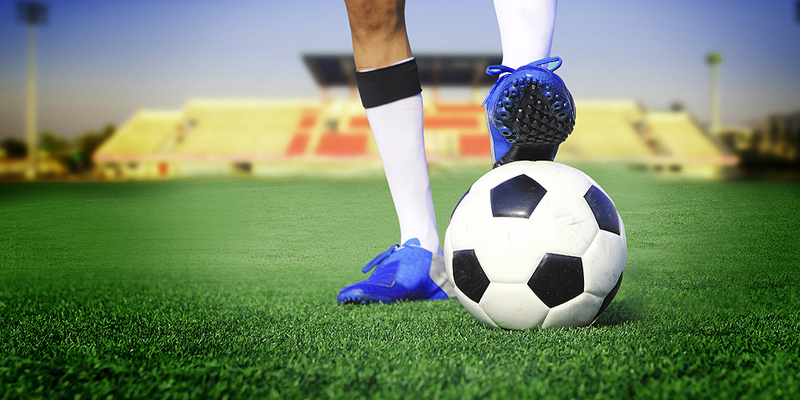 You can reduce your chances of injury while increasing your traction on the field. Muddy field? No issue. You should be able to stay upright if you have the right shoes. So if you’re ready to go out and get your shoes, WAIT! There are different kinds of short-cleat turf shoes. Some have the cleats molded right into them while others have cleats that you use a screwdriver to change out from short to long or in-between, depending on the condition of the field. OK, if you’re confused, relax. A lot of what goes into shoe choice is personal preference. Do some research. Narrow down a few brands. Then go to the store and try them on to see what fits your needs—and your feet—the best. Aim for a snug fit and make sure your toes don’t touch the end of the shoes but come within about a ½-inch of it. And remember that turf shoes are specific to…wait for it…synthetic turf, so don’t expect your new kicks to serve you well on live grass. If, however, you play on both artificial and natural surfaces, a great way to go is getting some firm-ground soccer cleats, which will work fine on both. You can always add a pair of turf shoes to your collection if you start playing exclusively on that surface. Now that you’ve purchased those new shoes, you are probably saying to yourself “I wish I could practice some moves on artificial grass in my backyard.” Well, you can. Watersavers has just the right sports turf for your home arena. You can chat online, visit one of our locations, call us at 1-844-974-8873, or get a free online quote. Our expert staff is waiting to assist you.